March for the Climate, and for Climate Science! Look for the University of Mount Union's Sustainability events on their website. The Third Annual Sustainable Alliance Festival in 2012 was held at the new Farm Girl's Pub & Grub restaurant, featuring local and organic foods, downtown Alliance. Abbe Honaker's family generously donated a hand-made quilt of re-purposed fabric, which was raffled to raise funds for local community garden efforts. Keep Alliance Beautiful held a workshop on recycling. The Second Sustainable Alliance Festival was a success! It featured movies, local watershed and historic area tours, family-friendly games and learning experiences, food and music, and all things sustainable! Click on this link for a schedule of last fall's Festival events and locations (pdf file). Alliance Farmers’ Market a huge success! "Markets in Motion - A new farmers' market helps an Ohio grower generate sales and capitalize on the locally grown trend". Follow this link to learn more about the activities of local community gardeners! Find books, videos, and more on issues around sustainability, and gardening! MISSION: It is the goal of the Mount Union Sustainability Committee to meet the growing concern for sustainability on our campus. Through education and communication, we will encourage and facilitate awareness and action on our campus and throughout the Alliance community. We will assist the University in its decision making process in these aspects, and will search out opportunities that are socially, financially and environmentally sound in order to create a sustainable, efficient, and healthy atmosphere for our students, faculty, and staff. The American College & University Presidents Climate Commitment is a high-visibility effort to address global warming by garnering institutional commitments to neutralize greenhouse gas emissions, and to accelerate the research and educational efforts of higher education to equip society to re-stabilize the earth’s climate. Under the guidance and direction of the Leadership Circle of presidents, the American College & University Presidents Climate Commitment is being supported and implemented by the Association for the Advancement of Sustainability in Higher Education (AASHE), Second Nature, and ecoAmerica. The University of Mount Union and the City of Alliance have created a statement of cooperation to encourage their working together on issues relating to sustainability. The agreement was signed by the President of the University and the Mayor of the City of Alliance on February 12, 2008 To read the agreement, click here. Now to continue throughout the year! The transportation subcommittee of GREEN ALLIANCE has dubbed every Friday as an opportunity to voluntarily reduce the area's carbon footprint by reducing our reliance on fossil fuels. On Fridays residents would be encouraged to utilize forms of transportation other than personal vehicles. They could choose to walk, ride a bicycle, carpool or take the bus, thus using less fossil fuel on that day. While participation in Fuel-Less Fridays could be done on an individual basis we are asking businesses to support those employees who might want to participate by encouraging them to form teams, and permitting more casual dress on Fridays. If you would like to know more or would like someone to give a presentation about Fuel-Less Fridays to your group, please contact Martha McClaugherty at (330) 821-6020. 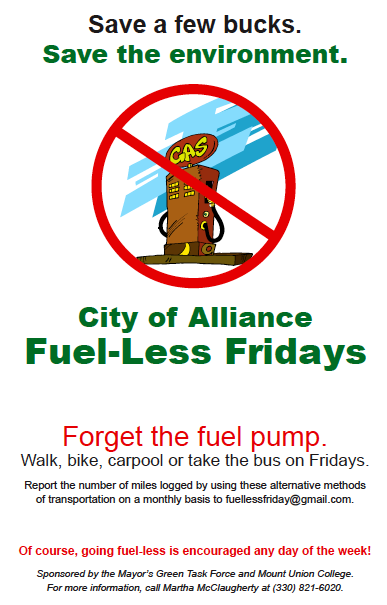 For a printable flier about Fuel-Less-Fridays, click here.